This model No. 135 was constructed in 1910, and Sears homes built in the early years (1908 to 1910) are rare finds. In 1910, Sears sold the customer all the materials needed to build the house, but the lumber was not pre-cut. No. 135 must have been a popular early model for Sears because it was offered for several years (1909 through 1915). The plat of survey was dated July 7, 1910. Plat provided by Marillyn Machon. Plat of survey showing the house. Hobart Avenue was called Ericsson Avenue in 1910. 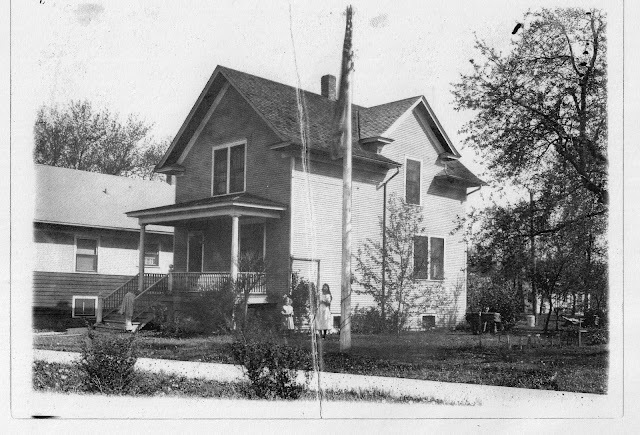 Charles Schneider, a German immigrant, and his wife Mary Anna purchased the lot in 1905 and the house from Sears in 1910. Charles worked for Sears, Roebuck as a maintenance manager. Mary Anna's brother (a building contractor) and a family friend built the house together. Daughter Helen Schneider remembered the horse-drawn wagon bringing the lumber and other materials from the Norwood Park train station. This must have been very exciting for a seven-year-old. After the basement was completed, Charles learned that Sears was transferring him to Dallas. His brother-in-law finished the house and Charles later sold it. And, as often happens, Charles was then transferred back to Chicago and managed to buy back his house in 1913. 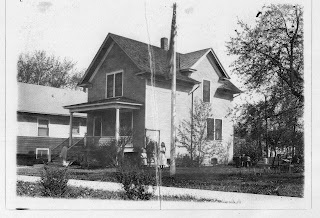 The house in 1917 with Helen Schneider age 14 and an unidentified girl. That is a wooden flagpole in the foreground. Photo courtesy of Marillyn Machon. The Schneider family owned the house for 91 years! Helen and her husband, Charles Kane, lived in the house after their marriage in 1923. Helen lived there until her death at age 101 in 2004. The changes made to the exterior of the house were done in the 1950's. The Kanes removed the front porch and added a bay window in the dining room. Floor plan for No. 135 from the 1913 Modern Homes catalog. Was the house built in Chicago the one owned by the Schneiders? Helen's daughter, Marillyn Machon, remembers a pergola covered with morning glory vines next to the dining room window. The house was originally on a double lot. Marillyn found arrowheads in the yard. The house was likely built over an old Indian trail. The house that was purchased for about $733 in 1910 was sold for $450,000 in 2004. The Sears house sold in one day and had five offers. Maybe the wrong offer was accepted. The people who purchased the house in 2004 chose to demolish it in September 2013. It's a shame this was torn down. Likely another McMansion coming soon? I just found the No 135 in Hunington Wv at 1520ish 9th Ave. Rosemary tells me the No 135 in St Louis is still there as well, or was several years ago.